Appledore V is a lovely small (65 feet sparred length), steel-hulled gaff topsail schooner launched in 1992, owned and operated by BaySail, a non-profit educational organization. 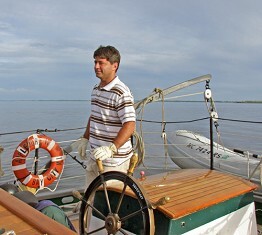 Her home port is Bay City, Michigan, on Lake Huron's Saginaw Bay, a port with a long history in ships and sailing ships in particular. 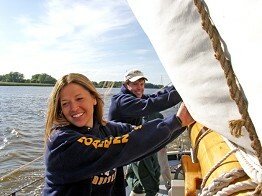 Her summer months sail training program, "Windward Bound", engages six youth trainees in every aspect of running the ship, from navigation and helmsmanship, to sail handling, galley duty, even manning the oars in Appledore's tender when they go ashore. Her usual sailing waters are in the Great Lakes, from Lake Huron's North Channel, to Mackinac Island, and up to Sault Sainte Marie and Lake Superior. 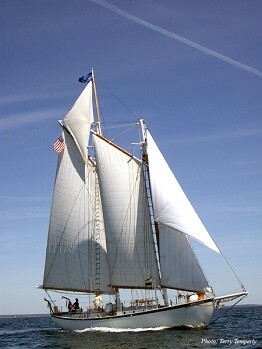 Appledore V has participated in numerous tall ship festivals, from the Great Lakes to the Atlantic Coast of the US & Canada. This summer she will be participating in the American Sail Training Association's Tall Ships Challenge, in the Great Lakes.